Oof. 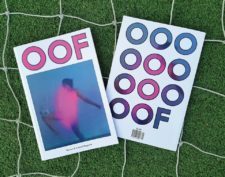 That’s the wonderfully onomatopoeic title of a new biannual magazine produced by Eddy Frankel, Time Out London’s art critic, that focuses on art and football as life-affirming, quintessentially communal experiences. Frankel writes in the introduction that “the artists in [the launch issue] peel back the layers of meaning in this obsessive sport, and help us to make sense of something bigger and more ungraspable in the process”. Leo Fitzmaurice, Petra Cortright and Chris Ofili are among the artists outlining their passion for the beautiful game. But 1-0 to Frankel for an illuminating interview with the uber-curator Hans-Ulrich Obrist and the octogenarian artist Rose Wylie, who describes her work Yellow Strip (2006), featuring five famous footballers. “I thought Wayne Rooney had an interesting shape because his legs are not paradigm football legs,” Wylie says. “And also Ronaldinho. He twitched a lot, and his ponytail twitched, and his hands twitched.” Back of the net.